Available in one and two metric ton capacities with 36 and 48 in. 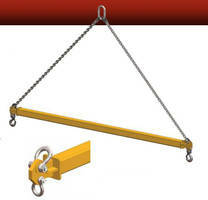 outside spreads, HFPSL Four Point Sack Lifter Beam comes with standard sling keeper. Offering 100,001 to 500,000 load cycles, HFPSL Lifter Beams natural fit over the top design allows for straight-line connection to lifting slings. Unit’s machined radius cut into the top inside edge of the bail provides secure connection between hook saddle and upper radius of the bail. Harrington Hoists, Inc. introduces their HFPSL, Four Point Sack Lifter Beam designed to lift bulk container sacks. The HFPSL is available in 1 and 2 Metric Ton capacities with outside spreads of 36 and 48 inches. The HFPSL Four Point Sack Lifter Beam features an X-Style design that provides a natural fit over the top of the bulk container sack and allows for a straight-line connection to lifting slings. Additional features include: a Standard Sling Keeper design to improve sling containment during the lift, a machined radius cut into the top inside edge of the bail to ensure a better connection between the saddle of the hook and the upper radius of the bail, smooth edge cross-beams to reduce wear on lifting straps, and can be ordered in Stainless Steel and Low Headroom designs. The HFPSL is engineered and manufactured to ASME B30.20 & BTH-1 Design Category B Service Class 2 and has a specified fatigue life of 100,001 to 500,000 load cycles. All HFPSL, Four Point Sack Lifter Beams are Proof-Tested to 125% capacity. Harrington Hoists, Inc. is a KITO Group Company located in Manheim, PA, Elizabethtown, PA, South Holland, IL and Corona, CA. and is a leading manufacturer of electric and air powered chain hoists, electric wire rope hoists, lever hoists, manual hand chain hoists, push and geared trolleys, overhead cranes, crane accessories, below-the-hook and material handling equipment.